Market volatility is like a zombie. You keep thinking its dead, but it keeps coming back to life and shambling onward. It’s been about 10 weeks since the February 5th selloff but high market volatility refuses to die. 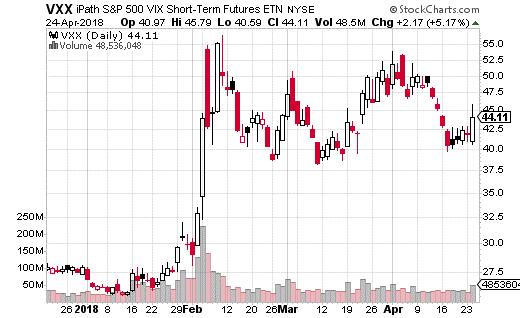 As you can see from the chart below, the iPath S&P 500 VIX Short-Term Futures ETN (NYSE: VXX) has basically been unable to stay below $40 for more than a day or two. Keep in mind, prior to the February correction, VXX was mostly sitting well below $30. VXX has become the go to method for trading short-term volatility. It was always popular, but with XIV gone (the inverse of VXX), it’s easily the most active ETP (exchange traded product) for volatility. VXX trades over 40 million shares a day on average, and has close to $900 million in assets. So what is keeping volatility from returning to its normally low levels? We actually have a confluence of events which are contributing to higher than usual volatility levels. These include political concerns (Mueller, tariffs), economic concerns (higher interest rates, tariffs), and financial worries (poor earnings). On their own, none of these concerns would merit a major reaction from the investment crowd. However, all these event together are ramping up concern over the expansion of the current bull market. Nevertheless, some options traders (with lots of capital) aren’t convinced volatility is going to remain elevated. In fact, there are sizeable options bets that VXX is going to be at around this level or lower both in the short-term and medium-term. One trader elected to sell over 11,500 May 25th VXX 53 calls with the stock at $43. The trader collected $1.46 in premium per call, which amounted to over $1.7 million in premiums. Breakeven is about $54.50, but anything under $53 on May 25th will result in the full premiums being collected. Another (or possibly the same trader) made a similar trade except for in June instead of May. This trader sold over 11,000 June 15th VXX 55 calls with the stock at $44.50. The premium collected in this case was $2.32 per contract or $2.6 million in premiums total. For this trade, breakeven occurs at around $57.50. I feel both trades are likely to be successful. Even if VXX spikes above $50, it isn’t likely to stay there for long. Still, I would never recommend being short naked calls for any trader, as the risk is virtually unlimited. Once again, I prefer to use put spreads when taking a short position on VXX. For example, the May 25th 36-40 put spread (buying the 40 put, selling the 36 put) costs about $1.25 with the stock at $44. For a month long trade, you’d only spend $125 per spread with the breakeven at $38.25 upon expiration. Even better, your max gain potential is $2.75 or $275 per spread. Since max loss is only $1.25, that means you can earn a 220% return on this trade. That’s clearly a very juicy return possibility, and your downside is capped. It’s the best of both worlds if you believe VXX is going lower over the next month. Will Stanley Black & Decker (SWK) Miss on Q3 Earnings?